"The world's refugee camps are often home to displaced entrepreneurs who set up small enterprises, driving the business case for financial services. But getting providers to take notice is a tough call, exacerbated by problems of access and identity, James King reports." 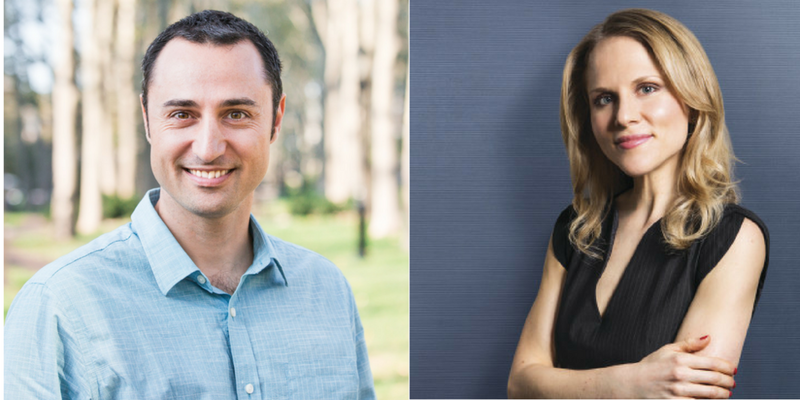 Through its investments and global partnerships, the Omidyar Network is tackling one of the biggest obstacles around refugee IDs – that of interoperability. In essence, this is the difficulty facing a refugee or migrant when every service provider or agency they encounter requires a different form of identification. Developing a foundational and interoperable form of ID would enable refugees to access a far wider suite of services and opportunities. But to achieve this, regional and global co-operation from various stakeholders is needed. “We want governance structures that allow the interoperability and portability of digital IDs across multiple markets,” says Ms Anderson. “There are a variety of stakeholders working to address somewhat different aspects of a similar problem but often in silos. Identity is an issue that needs to be solved at scale. For this to happen, actors must work in a more collaborative and consensus-building way,” she adds. Reaching this endpoint will take time and will demand an effective intersection between technology and regulation. In the meantime, other private sector actors are looking at the steps that can be taken on the ground. Increasingly, issues of refugee financing are attracting the attention of fintechs and start-ups who have been sold on the business case. Leaf Global Fintech, a Nashville-based business, is a case in point. Co-founded by Nat Robinson and Tori Samples, both of whom had prior experience working with refugees in Africa and the US, Leaf aims to address the refugee challenge virtually. The company, which is focusing on Rwanda and the Democratic Republic of the Congo, partners with local banks and mobile money operators to ensure the safe passage of funds for a refugee crossing the border between two jurisdictions. It achieves this by using blockchain technology. Ms Samples says: “There’s a lot of hype around blockchain. We are using it to facilitate cross-border transfers rather than storing any value on it.” For example, a user in the Democratic Republic of the Congo can open an account with Leaf via SMS, cross the border to Rwanda and receive their savings through a partner institution. In doing so, the company is addressing one of the key impediments facing mobile money networks in the region. “Mobile phone penetration across east Africa is high. Mobile money accounts are growing much faster than bank accounts. That’s also an avenue that we are looking to tap into. But the issue with mobile money is that it doesn’t cross borders. The issue with that is that it’s offered through national telcos,” says Mr Robinson. 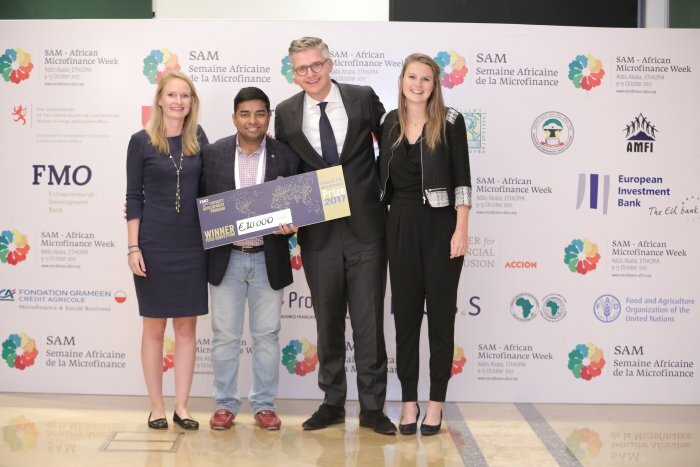 Catalyst Fund Investee Harvesting, won the FMO FinTech for Microfinance Prize of EUR 10.000 at the African Microfinance Week (SAM) in Addis Ababa, Ethopia. The jury consisting of FMO, the African Development Bank and Accion, chose Harvesting due to the scalability of its solution and that it uses satellite data information to fill a widespread information gap within the current financial system. This allows financial institutions to issue (new) loans to farmers and to better manage their agricultural portfolio since Harvesting provides information on farmers' crops, acres and production activities. Originally published on the SOCAP blog on September 12, 2017. 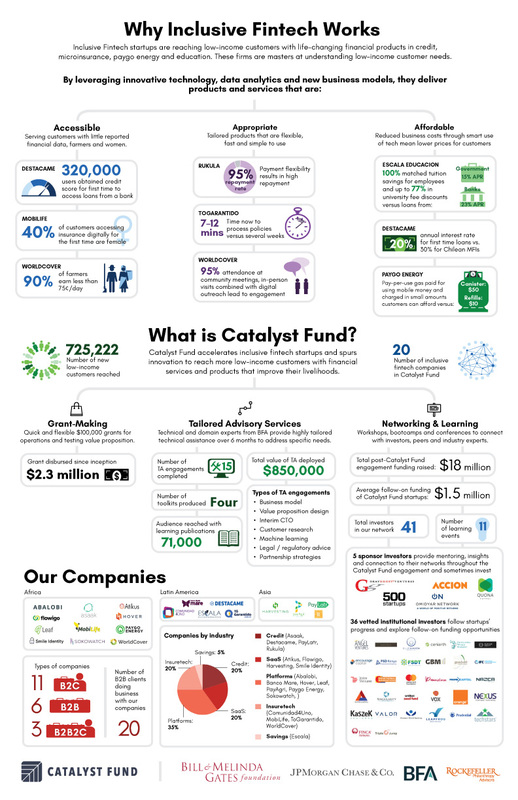 Catalyst Fund Investee Harvesting, has been shortlisted for the IBM WATSON AI XPRIZE competition and will present at the AI for Good Summit in Geneva, June 7-9, 2017. SANTIAGO, Chile, Jan. 18, 2017 /PRNewswire/ -- Chilean-based alternative credit scoring startup Destacame announced today that it has closed its seed round of financing. Funds will support the expansion of Destacame's services within Chile and into Mexico in 2017. Destacame is an alternative credit scoring platform that uses alternative data – such as utilities payment transactions – to assess an individual's creditworthiness. Destacame's proprietary algorithm synthesizes this customer data to generate an alternative credit score that can be provided to financial institutions to extend credit and other financial products to thin-file and credit-invisible customers. "We are thrilled to expand our work with a network of partners who are equally committed to building a more financially inclusive world," said Jorge Camus, Destacame´s Co-Founder. "This financial support, Accion Venture Lab's global experience in scaling businesses and working with companies in the alternative data space, and Mountain Nazca's expertise all over the region, can help scale Destacame's effort in Chile and throughout Latin America." "In too many instances, thin-file borrowers are neglected by formal financial institutions because serving these customers can be expensive, time-consuming, and subjective," said Michael Schlein, CEO and President of Accion. "Destacame addresses this problem by reducing the time, cost, and uncertainty of working with the underserved. With its strong leadership team, innovative technology, and commitment to the underserved, Destacame can ultimately help more people benefit from the world's financial system." Creditworthy applicants are often denied loans or credit cards because they lack the detailed credit histories on which banks rely to lend. Further, in Chile and throughout Latin America, for those who do have a credit history, credit scoring is primarily negative; it often over-accounts for negative behaviors, and does not factor in positive ones – such as a history of paying bills on time – that are not reported to credit bureaus. Destacame's algorithm factors in both positive and negative behaviors, helps thin- and no-file customers prove their ability to repay loans, and reduces the barriers that often prevent financial institutions from working with underserved individuals. The round was led by Accion Venture Lab, the seed-stage investment vehicle of financial inclusion leader Accion, which provides seed capital and management support to innovative startups that expand financial access to the poor and underserved. Venture Lab has already provided strategic advisory services to Destacame as a mentor through the Catalyst Fund. Mountain Nazca and several Chilean angel investors also contributed to the round. Destacame allows middle and lower socioeconomic segments to prove their credit worthiness by using positive data gathered from credit-like services such as utilities and telecoms companies. Destacame was launched in Chile on August 2015, currently has +170,000 users and has processed +10,000 credit applications. It was founded by Sebastian Ugarte, Augusto Ruiz-Tagle and Jorge Camus while they were finishing their MBA at MIT. It currently has 15 employees and offices in Chile and Mexico. More information, please visit www.destacame.cl. Accion is a global nonprofit dedicated to building a financially inclusive world with economic opportunity for all, by giving people the financial tools they need to improve their lives. We are building the next generation of top-tier microfinance institutions, and over more than 50 years have helped build 65 such institutions in 32 countries on four continents that today reach millions of clients. Our impact investing initiatives are pushing beyond microfinance to catalyze more than 30 innovative start-ups dedicated to improving the efficiency, reach, and scope of financial services for the poor. And our Center for Financial Inclusion is helping to build a stronger industry with high standards and broad engagement. Currently, our work spans nearly two dozen countries, including the U.S., where we are the nation's largest nonprofit microfinance network. For further information, visit http://www.accion.org.